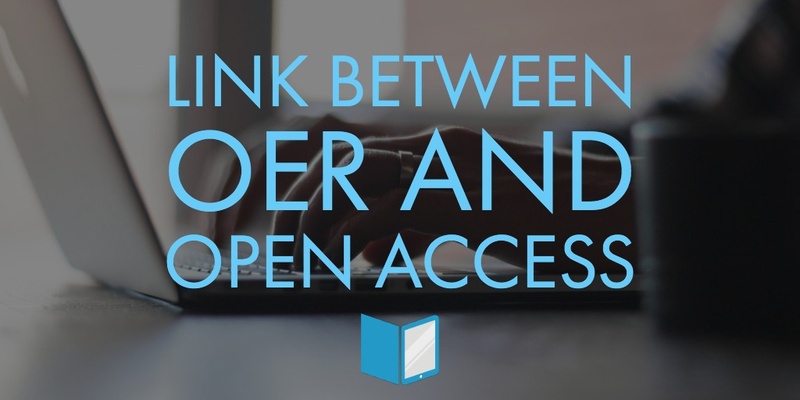 Open Educational Resources (OER) and Open Access (OA) are similar but not the same. While the primary difference between the two concepts is the purpose behind their creation, the synergy lies in quality, visibility, ease of access, and of course cost. OER are free or low-cost materials that are intended for teachers and learners, and they include the wide range of textbooks and related course resources. Released under a creative commons (CC) or some other open license, or even with a complete waiver of copyright (in which case it is released to the “public domain”), OER are available online and educators are able to adapt and build on them and in this way share their knowledge. They may also be used by researchers who can use and/or adapt the material and then redistribute it. OA enables anyone to access research documents and other publications from the Internet, also for free or for a relatively low fee. Its focus is on learning environments and the movement aims to capture a global student-teacher audience in distance-learning and open-learning environments. Libraries worldwide are attempting to build digital repositories that will enable them to make research available via the OA route. Both OER and OA materials take different forms including text, images of various types, video, and audio. Text is peer-reviewed, whether it is in the form of articles, research, textbooks, or anything else. However, the original OER concept was specifically to provide students and teachers with free access to higher education curriculum materials. The OA movement was launched to enable sharing of research documents and academic journals online. Licensing of both is similar, and both provide options for publishers and authors. In spite of the peer-review factor, a possible disadvantage of both OER and OA is that content may be poor largely because it is so easy to self-publish without the usual checks and balances. Ultimately, whether defined as OER or OA, materials are free or normally cheap, or at least a lot less expensive than materials that are produced in the traditional way. But since OA is a broader term, not everything that offers open access is quality OER, and is not necessarily considered to be OA material. In other words, some open materials are more “open” than others! Copyright is an important issue that must be considered when publishing OER or releasing OA materials. With both OER and OA materials, only the creator of the original material or publisher (which might be an academic institution or an employer) if the creator signed over copyright, may allow copyright to be assigned to any person or body. Using a CC license simplifies things because there is a choice of what is allowed, for instance, whether resources and materials may be used commercially. But the person releasing or publishing the material must be the copyright owner to avoid any type of infringement. And if the material is added to or adapted, there needs to be total clarity in terms of what the originator has allowed. For instance, a basic type of OA known as gold OA generally removes permission barriers and authors usually retain copyright to the original work. But the OA content can be added to and re-used in any form. The author might require a citation in the reworked version and there may be restrictions in terms of how and where the work may be used. With OER, one of the issues is that often video, audio, photographic, and other materials are included in publications like textbooks. While these add value to the publications, it is vital that copyright owners are consulted and that they consent to the material being released under CC or another open license. While OA publications are often free, subscription titles that are also deemed to be OA, in fact, carry a fee. Well-known organizations like Springer and Elsevier offer both options though there is some resistance to their policies of constantly increasing subscription rates, even though an increasing number of articles and journals are shared, which in effect increases their revenue. Clearly, publishers need money. So if there isn’t any form of funding – either private or governmental – they need to charge for what they publish. This has lead to disputes that might threaten OA. For instance, earlier this year (2018) a number of Swedish research institutions and universities announced they would not be renewing their contracts with Elsevier because of an increase in subscription rates. About 200 German institutions have also canceled their subscription deals with Elsevier. The Netherlands-based organization has though managed to stave off cancellations from library consortia in South Korea and Finland. Similarly, a large number of French universities and research institutions have canceled their contracts with the long-established US company Springer for the same reason. The OER scenario is even more complicated, with OER providers offering different options. For instance, Lumen and Top Hat offer peer-to-peer models that are outcomes-based, while OER publishers are developing their own varied strategies. Both John Wiley & Sons and the adaptive learning company, Knewton, seem to be following the outcomes-based approach. Knewton also has its own CC license. While there is general agreement that OER must be both accessible and affordable, some OER providers do not allow content to be altered and others restrict commercial use. However, the largest US-based higher education supplier of learning and teaching materials, Cengage has taken a total U-turn in terms of textbook offerings. Rightly or wrongly, Cengage Learning turned the industry upside down when it announced it was planning to introduce a flat fees policy for digital textbooks from August 2018 and make the company 90 percent digital by 2019. The company’s OpenNow suite of OER products will make more than 22,000 products available to students for only @119.99 each semester. This relates to 70 disciplines and impacts on more than 675 courses. If students don’t want to subscribe to all the courses, they can opt to pay $25 for each course. Brave as it might be, the move has attracted major disapproval from many other quarters including the influential OER provider Lumen. Essentially, while other major players in the digital learning environment, like McGraw Hill and Pearson, are committed to online learning initiatives, the Cengage flat fee offering has not been generally welcomed by competitors. While all three of the academic publishers mentioned here were suffering substantial losses and/or at very least declining performance, Cengage decided on a Netflix-type fee that depended on subscriptions for OER – even though these aren’t the same as the subscriptions that OA depends on. Printed and digital textbooks, online solutions, and digital study tools will all soon be available for a flat fee subscription. From this month (August 2018), students can access every Cengage course on offer for only $180 a year! And Cengage isn’t stopping there. Last month, the education and technology company announced that it was making additional learning material OER. This includes three licensed textbooks, and learning objectives as well as assessments for 12-course areas. These can all be downloaded free from the Cengage website. So What Does This Mean to OER and OA? Those in the know say this is an important initiative that will hopefully encourage both non-profit and for-profit organizations to work together for the good of students. Certainly, it’s innovative, and it should lead to future collaborations that will continue to ensure that the link between OER and OA becomes a solid bond. Of course, any content needs to be professionally produced and published. Gutenberg Technology’s MyEcontentFactory simplifies the process and enables authors and publishers to create an exciting interactive e-learning experience. Why don’t you sign up for a free trial today?